Written and letterpressed for work Orbit. The place where past and present meet is a liminal state. It is not unlike the skin that protects internal organs from the elements, or the surface of the ocean, where vessels skim the division between sea and sky. The place where past and present meet is not unlike a window, which allows views in as well as out. The liminal state is a tenuous one. We gain perspective only by cycling back and forth. We see the outdoors from inside our home, and we see our home as we return to it from our ventures in the world. Some of these states are more easily grasped by us than are others — more easily sensed, observed, accessed. It is a fairly simple exercise to determine where your body ends and where the world beyond it begins — easier, say, than resolving the atmospheric koan as to where, exactly, the sky begins. Certainly, we cannot step into the past with the same ease with which we can open our front door. However, once we accept that the division between past and present resembles more familiar liminal states, we can map common experiences onto the more esoteric. 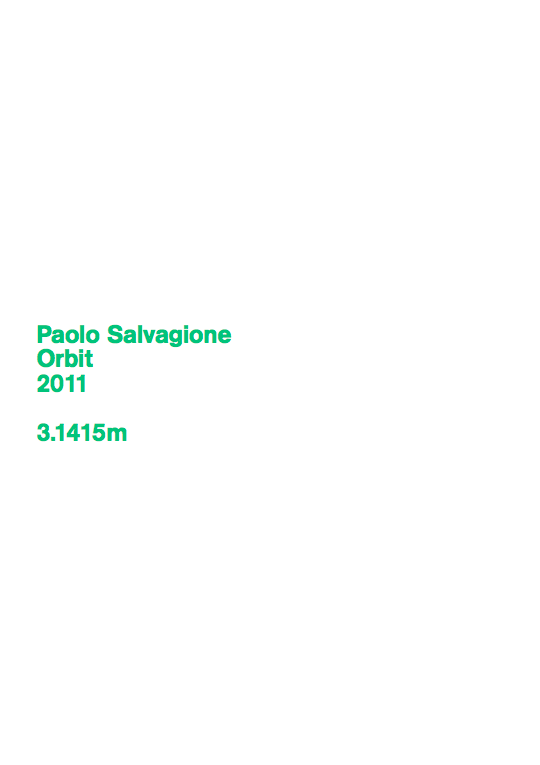 To take a seat on Paolo Salvagione’s Orbit is to ride that liminal state. To buckle in and pull tight its strap is to acknowledge the tenuous nature of being in between realms, as if taking precautions against psychic turbulence, as well as physical injury. To take that seat is to enter a mode of technologically mediated meditation. To submit to Orbit is to momentarily float free from gravity, free from now. 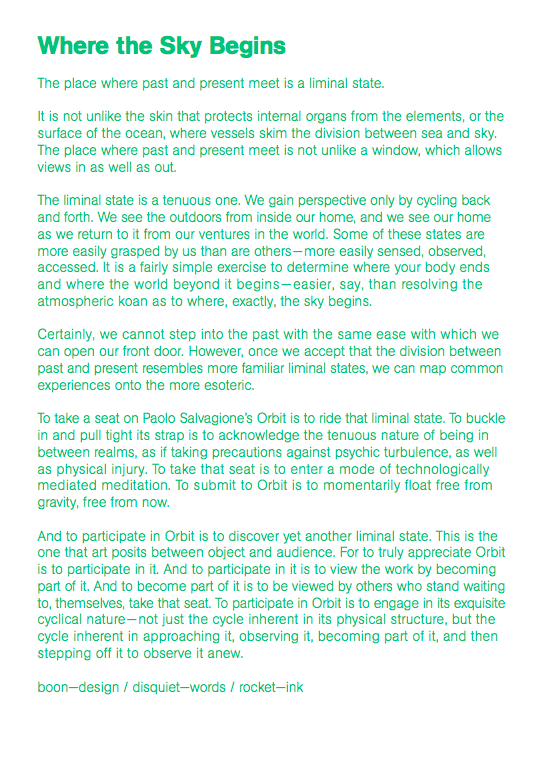 And to participate in Orbit is to discover yet another liminal state. This is the one that art posits between object and audience. For to truly appreciate Orbit is to participate in it. And to participate in it is to view the work by becoming part of it. And to become part of it is to be viewed by others who stand waiting to, themselves, take that seat. To participate in Orbit is to engage in its exquisite cyclical nature — not just the cycle inherent in its physical structure, but the cycle inherent in approaching it, observing it, becoming part of it, and then stepping off it to observe it anew.